The Chrysler Portal concept "explores the possibility of what a family transportation vehicle could look like,'' Fiat Chrysler said. Fiat Chrysler Automobiles is laying out a vision of a battery-powered, self-driving minivan that it bets even a millennial could love. That may not be enough to shake the automaker's image as the purveyor of the least fuel-efficient fleet in the U.S. 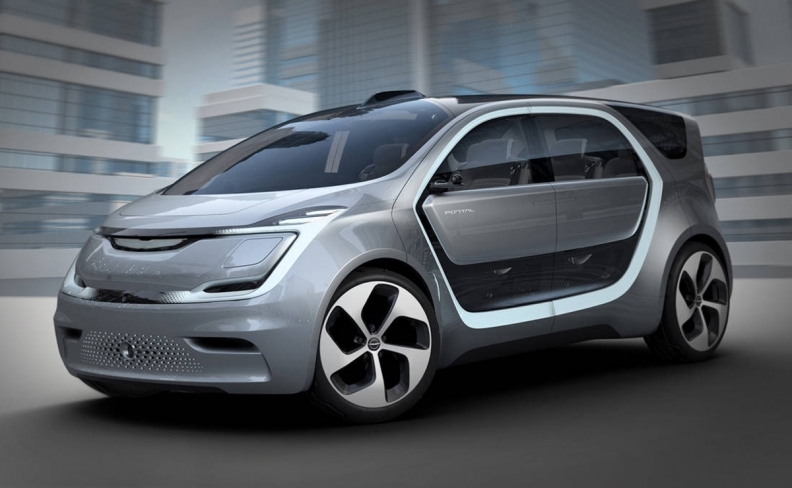 The minivan, whose design concept is called the Chrysler Portal, would have a 250-mile (400 km) electric range and enough screens, ports and social-media options to entertain young families while software handles much of the driving. It's being unveiled at 1 p.m. local time today in Las Vegas, where consumer technology show CES 2017 begins this week. It's always a long way from concept cars until a vehicle enters production -- if ever -- and so far Fiat Chrysler's U.S. unit hasn't said it actually plans to build an all-electric minivan like the Portal. What the automaker's effort may produce, however, is a change in the conversation: It's been criticized for adding ecological powertrains more slowly than rivals like Toyota Motor and General Motors and for failing to gain ground on fuel economy. The Portal nonetheless gives the automaker a place in the discussion about fuel-saving technologies. Fiat Chrysler's stock languished for most of 2016 in part because it was perceived as being the least prepared for the tightened fuel-economy standards put in place under President Barack Obama's administration. In a twist, the company's U.S. shares have surged since the November election victory of Donald Trump, whose pledge to reduce regulations has led to speculation he will dismantle Obama's mandates. The stock soared 29 percent since Election Day to end 2016 at $9.12, its highest close since the last day of 2015. Ford Motor Co. rose 5.7 percent and GM gained about 10 percent in the same period. The six-passenger Portal concept "explores the possibility of what a family transportation vehicle could look like,'' Fiat Chrysler said in a statement ahead of today's presentation. The idea is to create a third environment, aside from home and the office, with connectivity to personal devices and the cloud. The Portal would handle steering, braking and acceleration on sections of highway approved for this purpose and would alert the driver to retake control if necessary. Nissan Motor plans a similar system, including for urban streets, by the end of the decade. Flat battery packs would be built into the floor, like in Tesla Motors' Model X sport utility vehicle. With a fast charger, drivers could restore enough power for 150 miles of driving in 20 minutes, the company projected. While Fiat Chrysler said the vehicle would be aimed at "cost-conscious" millennials, it gave no projected price range. Such technology doesn't come cheap, at least not yet. The only comparable vehicle today is the seven-passenger Tesla Model X, which weighs 5,400 pounds (2,450 kg) with its batteries and costs $93,000 on average. Current Pacifica minivans cost half that and weigh in at less than 5,000 pounds for the hybrid, which is rated to provide 33 miles of all-electric range. Fiat Chrysler made no mention of how it's developing the self-driving technology and didn't specify suppliers' roles. Last month, the company said it has delivered 100 Pacifica hybrids to Waymo, the autonomous-driving unit of Google parent Alphabet. The agreement may help Fiat Chrysler -- building prestige and pricing power -- if Waymo ends up putting thousands of such minivans on U.S. roads before other companies, said Mike Ramsey, research director at Gartner. "It could help them charge more for everything they sell,'' Ramsey said. While the Portal gives a glimpse of where Fiat Chrysler sees transportation headed, for now the company in many ways remains a technical laggard. CEO Sergio Marchionne has focused on paying down what is now $6.5 billion in industrial debt, and warned in 2015 that Fiat Chrysler and other automakers need to merge to afford technologies like self-driving and electric cars. After a rebuff from GM, Marchionne said any combination will have to wait until he retires in a few years. In 2015, just 0.4 percent of the company's U.S. fleet was powered by alternative-fuel vehicles like electric cars, about one-seventh as much as Germany's BMW AG including its Mini brand, government statistics show. Its cars tied with Mercedes for second-worst in fuel economy in 2015. The new Pacifica variant, its first hybrid in eight years, is just hitting the streets while Toyota makes about a million hybrids every nine months. Consumer Reports ranks Fiat Chrysler as producing four of the 10 least reliable vehicles. Less than one in 10 of its models come with direct-injected and turbo-charged engines to conserve gas. For the 2016 model year, U.S. regulators predict the automaker's trucks will average 25.7 miles per gallon, excluding credits for some fuel-saving technology. That average will have to rise to 31.8 mpg by 2020 to meet the U.S. standard, according to Gopal Duleep, president of H-D Systems, a Washington-based research company. By that same year, Fiat Chrysler's cars will need to average 41.8 mpg, up from 31.2 today, he said.